How to interpret the forecast result? How can someone like a sales manager benefit from this? How to assess the quality of a time series forecast? The time series forecasting feature in SAP Analytics Cloud performs advanced statistical analysis to generate forecasts by analyzing trends, fluctuations and seasonality. The forecasting function uses SAP’s proprietary time series technology (leveraging SAP Cloud Platform predictive services) to analyze historical time series data. Embedded in a business user-friendly interface, users can simply select between different time series algorithms based on their needs. This functionality assists business users in making precise data-driven decisions especially when combined with their business planning processes. 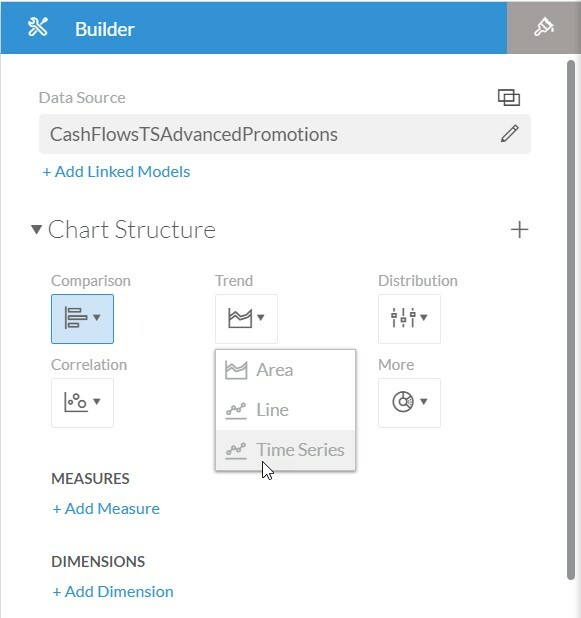 With a time-series chart, a user can choose between three modeling techniques – Automatic forecasting, Triple Exponential Smoothing, and Advanced forecasting to aid in their decision-making process. Automatic Forecasting uses historical data to predict future values – varies time series models are tested and the one with the best result is returned. Triple Exponential Smoothing uses historical data to predict future values. 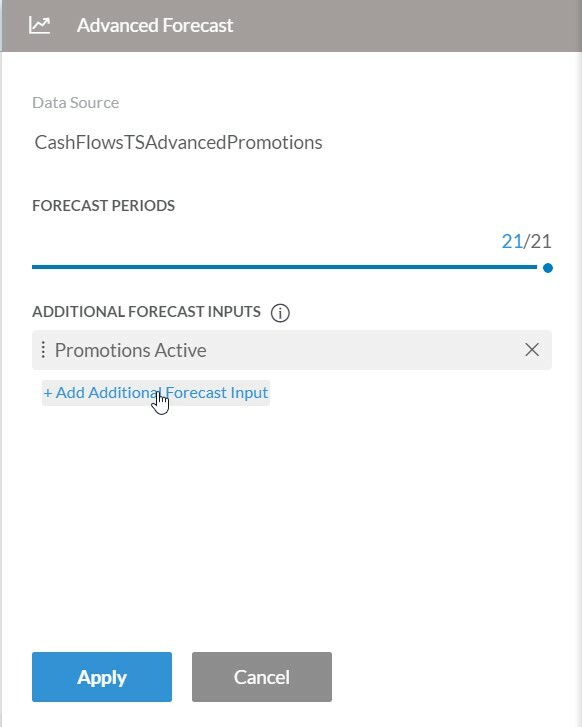 Advanced Forecasting allows the user to add additional forecast inputs to be considered, such as upcoming promotional offerings. For each forecasting period, the time series model generated by SAC outputs a forecasted value (shown as a dashed line), and a confidence interval which corresponds to the upper and lower limit with respect to the forecasted value (shown as a shaded area). The forecasted value is a point estimate of the best guess at a given period. On the other hand, the confidence interval, whose width is twice the standard error of the forecasted values, provides an upper and lower expectation for the forecasted value. By default, the 95% confidence interval is used, allowing the user to be 95% confident that the actual value will lie within the interval. Use Case Scenario: How can a sales manager benefit from this? Using the forecasting feature, you will be able to discover past data trends that may impact various KPIs such as revenue, churn, and productivity. For example, a sales manager can use predictive forecasting to project sales revenue for the upcoming season. To get started, upload a dataset and make sure there is historical data so the system can use this to look for trends. Under the Trend dropdown, choose a Time Series chart as this is the chart that you will be applying predictive analysis upon. With the chart selected, click ‘Add Forecast’ to see the various forecasting options. Let’s go over these three different options one by one. In the background, this option will go over different time series forecasting model and return the one that best fits the data. This option is uses triple exponential smoothing as its underlying time series forecasting model. If you have future data inputs, utilizing this option will provide a more accurate forecast on your data. Select “Add Additional Forecast Input” and select the input you would like to have considered. In this case, we are aware of the dates in which various promotions will be active. We can see from the output that the shared area of the confidence interval is far smaller, meaning we are more confident in knowing what are predicted sales will be. For any of the options, you can choose the desired number of forecast periods. In Automatic and Triple Exponential Smoothing forecasts, the maximum number you can forecast is determined by the amount of historical data you have. In the case of Advanced Forecasting, it is determined by the number of future periods included in the additional factors. When you select a data point, you can see the upper and lower confidence bounds (i.e. probability of accuracy in the prediction). You can also edit the forecast if you like such as change the color or add another variable. Quality score measures how well the model matches the data, and it is calculated from the Mean Absolute Percentage Error (MAPE) of the forecast and the predicted outcomes. MAPE measures the size of error in percentage terms. For example, a quality indicator of 5 means the forecast is at least 80% correct. The forecasting chart in SAP Analytics Cloud also lets you test the accuracy of forecasts by predicting past values. You can compare the predicted values against the real values and visually determine whether the model is doing a fair job of predicting (click “show/hide”, check “Past Period Forecast”). If the prediction intervals are very extended and wide, this indicates the confidence of the model is very low. Ideally, the narrower the prediction interval, the higher the forecasting quality. With accurate forecasts, predicting future results saves costly mistakes from being made and allows easier decisions to guide you to success.